Poker Players with a Fashion Sense | Memorable Days : Beauty Blog - Korean Beauty, European, American Product Reviews. It has been a while that I went to the casino to play roulette and poker. No i'm not addicted at all, it's just fun to play once in a while and to test out my luck. I usually lose to be honest lol, I always have bad luck. Anyways, I was checking out my wardrobe and was wondering what to wear. Seriously, I had no clue! I googled a bit to get some fashion inspiration and checked out some videos on Youtube. Eventually, I didn’t find anything suitable for me. However, while searching on Google I saw that there are actually some fashionable poker players and poker models in the world lol. Sounds kind of weird huh, but they really do exist! This fashion model who turned poker pro Lacey Jones (see pictures above) is definitely not a “jeans and t-shirt” type of girl and is among the most fashionable players in the game of poker. She's probably not the best in playing poker but she is the most fashionable one. It's pretty awesome to get that title right? Another fashionable player is Tony Dunst. He has his own sense of fashion at the poker tables (see pictures below). Silk suits, sans tie and designer sunglasses has him looking like he just rolled in from a secret mission. 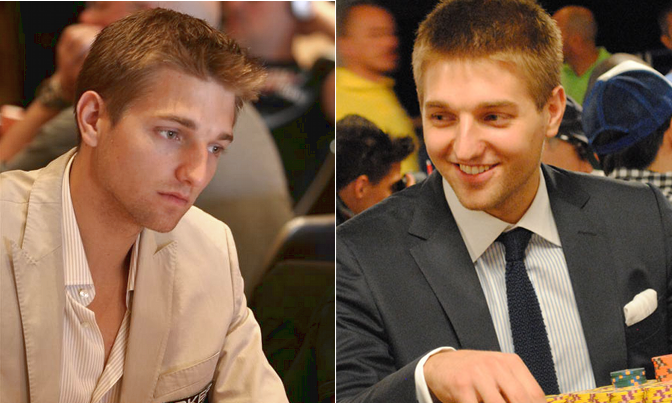 People usually call him the "James Bond of poker players" because of his image. These two famous people are looking a bit like superstars lol.. I don't know why, probably because of their image and clothing?! As you can see, fashion is also important when going to the casino. Dress prettier and you probably will get that title as well in your country ;). Have you ever been to a casino before? This article is in collaboration with courtney b.